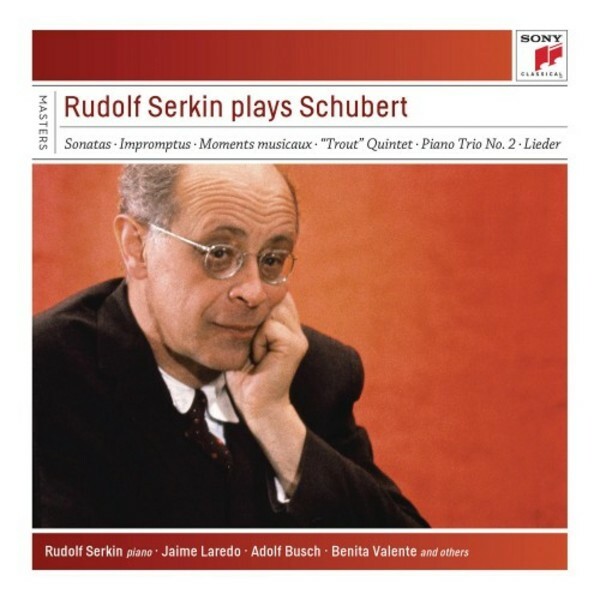 Pianist Rudolf Serkin is often recalled as one of the 20th century’s most commanding performers of Mozart, Beethoven and Brahms. But he was always a masterful Schubertian as well. After the war, he became American Columbia’s premier pianist in the Classic-Romantic repertoire. This 5-CD box gathers his recordings of the last two Schubert Sonatas – two different ones of the great B flat, D.960: one from 1975 and a live 1977 performance from Carnegie Hall – as well as the Impromptus, Moments musicaux, the 'Trout' Quintet (from the Marlboro Festival with “an enthusiastic group that rises to the work’s challenges and Serkin’s inspired promptings” – AllMusic.com) and the exquisite late chamber songs 'Auf dem Strom' and 'Der Hirt auf dem Felsen', in which he is joined by soprano Benita Valente, horn Myron Bloom and clarinet Harold Wright.